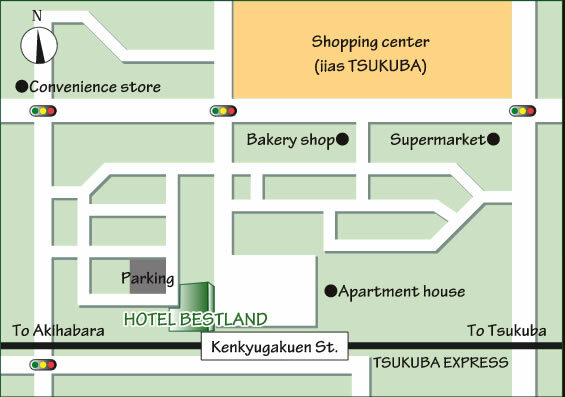 HOTEL BESTLAND is located in front of Kenkyu-Gakuen station with latest facilities to provide relaxing moments for our guests. Tsukuba where we are in is known as the city of science and technology with more than 300 of research organization and research institutions of major companies. Tsukuba is now developing to be one of the major cities in Japan; especially Kenkyu-Gakuen area is expected to be the center of the city in the near future. And this area can access from Tokyo area only within 1hour. So you can stay for sightseeing in your vacation not only business. It will be a pleasure for us to have you as our guest and spend wonderful time with us. We are looking forward to see you as our guest. Trouser press, Iron, Air cleaner, Humidifier, Laptop computer, Printer, etc Please ask reception staff for other lending items. ※The ice-maker is on every floor except for first, second, and sixth floor. ・ About 50 minutes to Kenkyu-Gakuen station from Akihabara station by TSUKUBA EXPRESS (Semi-rapid). ・ About 60 minutes to Tokyo station from NARITA AIRPORT station by JR NARITA EXPRESS. ・ About 5 minutes to Akihabara station from Tokyo station by JR Yamanote line or JR Keihintohoku line. ・ About 50 minutes to Kenkyu-Gakuen station from Akihabara station by TSUKUBA EXPRESS. ・ About 60 minutes to Nippori station from NARITA AIRPORT station by KEISEI skyliner. ・ About 5 minutes to Kitasenju station from Nippori station by JR Joban line. ・ 45 minutes to Kenkyu-Gakuen station from Kitasenju station by TSUKUBA EXPRESS. from NARITA AIRPORT by NATT’S(Highway Limousine bus). ・ A	About 3 minutes to Kenkyu-Gakuen station from Tsukuba center（Tsukuba station) by TSUKUBA EXPRESS. ・ About 25 minutes to Hamamatsucho station from Haneda airport by TOKYO MONORAIL. by JR Yamanote line or JR Keihintohoku line. ・ About 50 minutes to Kenkyugakuen station from Akihabara station by TSUKUBA EXPRESS. Copyright c 2008 HOTEL BESTLAND. ALL RIGHTS RESERVED.